There is something utterly relaxing and at the same time truly energizing about sailing. It might be the wind in the sails and the surge of energy you feel with each gust. It might be the lapping of waves on the boat’s hull or her movement through the water just under your feet. It might be the hypnotic sound of winches and rigging, the whoosh of the air in the canvas, the wind in your hair and the fresh sea breeze on your face. It might be the quiet you feel as the wind blows sound away. You float on a vast sea, under an endless sky, and you realize you are a tiny speck in the universe with nothing in your way. Now imagine this setting for a party. Let’s call it a celebration. You are going to dance on the surface on the ocean, on a catamaran: A flat bottom sailboat that sits on two pontoons that suspend the deck and your dance and dinning area. 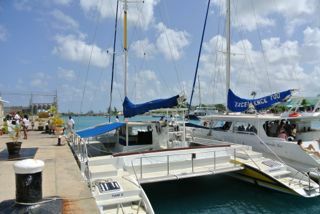 Catamarans are the perfect solution for a party boat. First, It is a far more stable sail than a deep single hull boat that slices the water at a steep angle in a strong cross wind, making it hard to stand and impossible to dance. 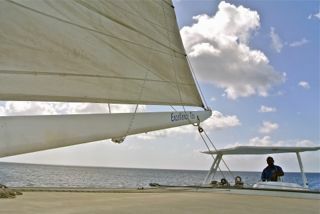 Many are now purpose built for coastal cruises, gourmet dinning and fun sails, with music and dancing. 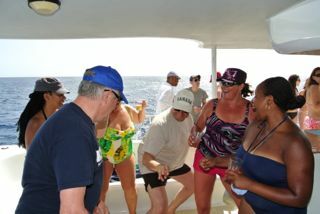 Even under full sail, party goers can jump and jive to the music while the boat moves fast across the ocean, the water rushing just under your feet. along the coast by day and by night. Moonlight cruises with soft jazz and champagne are arranged on special full moon occasions, and most islands have daily sunset cruises and lunch excursions.